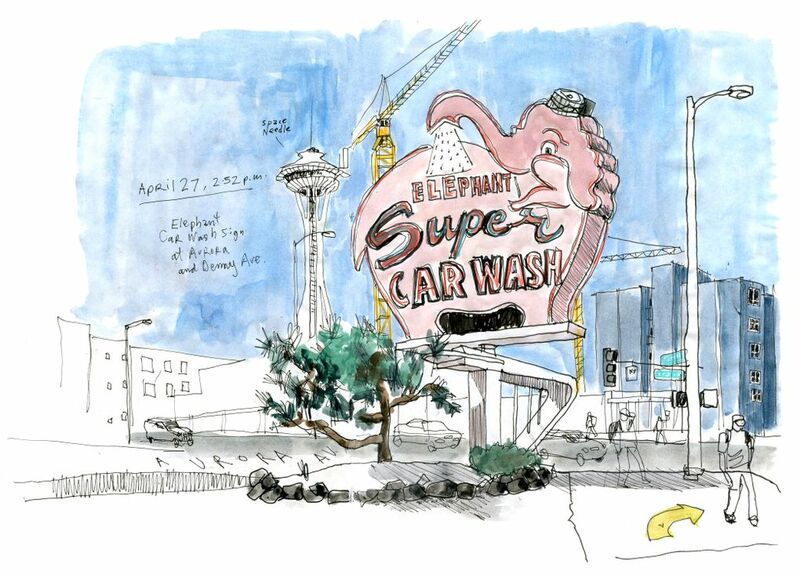 The pink elephant of the Elephant Car Wash is a Seattle landmark, and as these two sketches from the Seattle Sketcher show, the pink elephant has stood proud as the neighborhood around it evolved into today's tech central. If signs could talk, the Elephant Car Wash billboard at Denny Way and Aurora Avenue would have a lot of stories to tell. 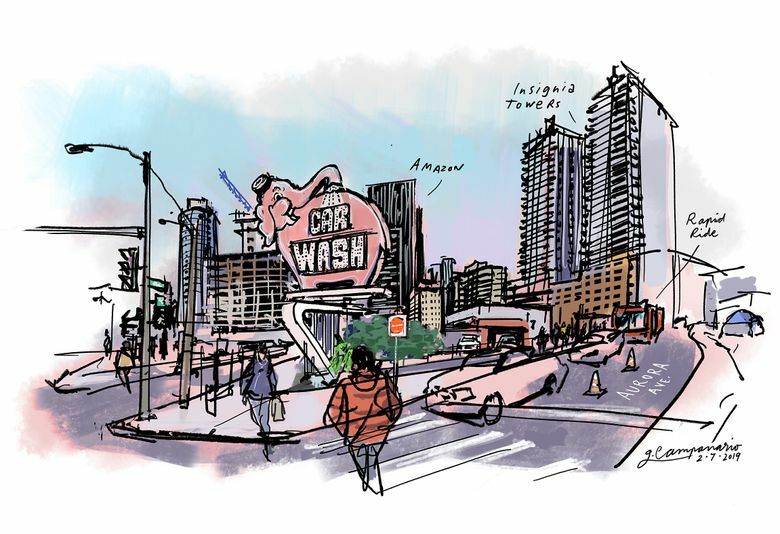 Since the legendary car wash opened in 1956, the rotating pink elephant has witnessed the Space Needle go up and Amazon’s headquarters emerge from former parking lots just a few blocks away. In recent years, residential skyscrapers have inched closer to its turf, and more 40-story towers are under construction or soon to break ground in its 360-degree field of vision. I wouldn’t blame the quirky elephant for feeling a bit uneasy as he watches Seattle grow up into a much different city. His good neighbor the Battery Street Tunnel just closed forever. And even Aurora Avenue, the street it has presided over for decades, will be renamed Borealis in that stretch. But despite all the transformation, the good old pink elephant keeps grinning and spinning, perhaps reminding us to keep a good attitude in the face of so much change. P.S. : Just like when I drew the Elephant 10 years ago, when my Seattle Sketcher column made its debut, this post marks the beginning of a new chapter in my illustrated journal of life in the region. Starting Sunday, you will find the print version of Seattle Sketcher on the back page of the Sunday features section, also known as “The Mix.” As always, I look forward to your feedback and suggestions of interesting places and people to portray.